The Food and Agriculture Organization of the United Nations estimates that "a third of all the food produced in the world is never consumed," totaling about 1.3 billion tons of waste a year. The United States alone wastes 40% of all food, worth an estimated $165 billion. This waste decays in landfills and, without oxygen present, emits methane, which is a more potent greenhouse gas than carbon dioxide. Consequently, food waste creates an overwhelming 3.3 billion tons of greenhouse gases annually and US greenhouse gas emissions account for 19% of the world's total emissions, second only to China. This alarming figure led UC College of Engineering and Applied Science (CEAS) researchers to investigate alternatives to landfilling organic wastes. In October 2013, environmental engineering colleagues from the CEAS Department of Biomedical, Chemical, and Environmental Engineering, Timothy C. Keener, PhD, and Drew C. McAvoy, PhD—along with fellow faculty members Pablo Campo-Moreno, PhD, San-Mou Jeng, PhD, and George Sorial, PhD—proposed an innovative Smart Cities Project titled "A Pilot Study to Produce Bioenergy and Fertilizer from UC's Food Waste." The proposal to convert food waste into gaseous fuels, solid fuels, biodiesel and other products was accepted and today, the study flourishes under the direction of Keener and McAvoy. In October 2014, the team launched a pilot plant that has diverted 660 pounds of food waste generated from UC's Center Court Dining Center for research. The researchers have since developed a breakthrough synergistic technology that uses anaerobic digestion to turn nutrient-rich organic materials into fuel (biogas), fertilizer, or soil conditioner, while using the carbon dioxide fraction of the biogas to grow algae. 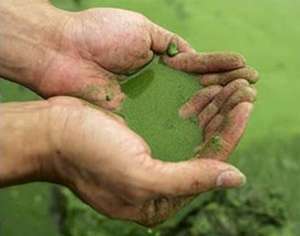 Simultaneously, lipid oils in the algae are also extracted and converted to biodiesel. This novel process, which essentially integrates algae production with anaerobic digestion, allows researchers to almost completely utilize the carbon found in food waste in a renewable manner. 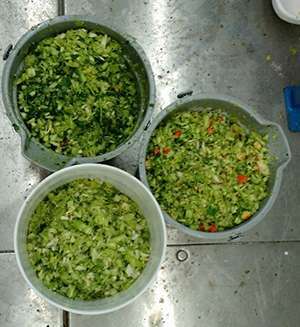 McAvoy explains, "The anaerobic digestion of food waste coupled with algae production seems to be an attractive alternative for not only reducing greenhouse gas emissions, but also for the production of renewable energy." The safe, effective production of plentiful biofuels provides a sustainable source of liquid, solid and gaseous fuels which will minimize or, hopefully, eliminate the use of fossil fuels. In turn, this will curtail or reduce the atmospheric concentration of greenhouse gases. The process would also reduce the release the hundreds of millions of tons of methane and convert millions of tons of carbon dioxide gas into biofuel. 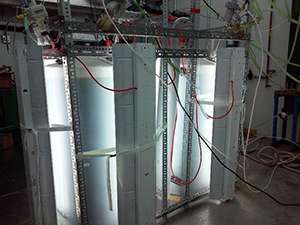 Equipment used to promote the growth of algae. Keener and McAvoy recently presented their research results related to their Renewable Energy Grant, and were well-received by colleagues. They are currently forming a partnership with Rumpke, and hope to eventually develop a long range plan with the City of Cincinnati to promote the development of a central facility. Keener says, "There is a critical need to optimize the unit operations involved in the mass production of microalgae if this potential biofuel source were to become a reality, making a central facility an absolute necessity moving forward." It is evident that energy sustainability is the key to properly managing the world's greenhouse gas emissions. With the help of these CEAS researchers, we are one step closer to improving our environment, and therefore, our quality of life.